In 2008, I discovered felting needles and wool rovings. 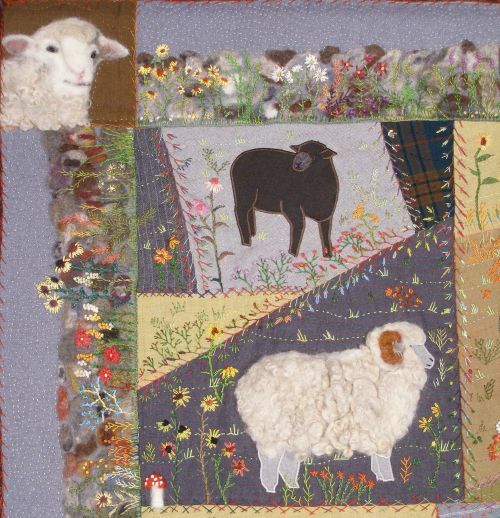 I took our Woolly Sheep pattern and developed it into a wool Crazy Quilt with some of the appliqued sheep felted and some just machine appliqued. 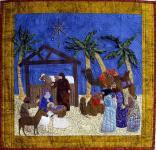 The quilt is made of suiting weight wool fabric. I was wondering what sheep would look like in pin stripes. Then I began embroidering the daisy chains around the necks of some of the sheep, like hippies wore in the 70's. All the hand embroidery was done with pearl cotton thread in size 8 or 12. This quilt was at least two years in the making. Most of that time was spent thinking about what would be the next step. The quilt was completed in December 2009 because I had the goal of entering it into the 2010 Road to California show. My quilt is about 49" high x 52" wide. Yours could be any size you desire. This quilt won "Best Innovative Quilt - Other" award at the Road to CA show, 1/13/2010. The category "Other" is where crazy quilt quilts were to be judged. It also won Best Hand Workmansip, and Viewers Choice awards at the Tri-State (NJ, NY and PA) Quilt Show in Somerset, NJ, on March 6, 2010 and Best Hand Workmansip, at World Quilt competition in Manchester NH in mid August 2010. It went on tour of three other Mancuso shows: Oaks,PA, PIQF in Santa Clara CA, and West Palm Beach FL. 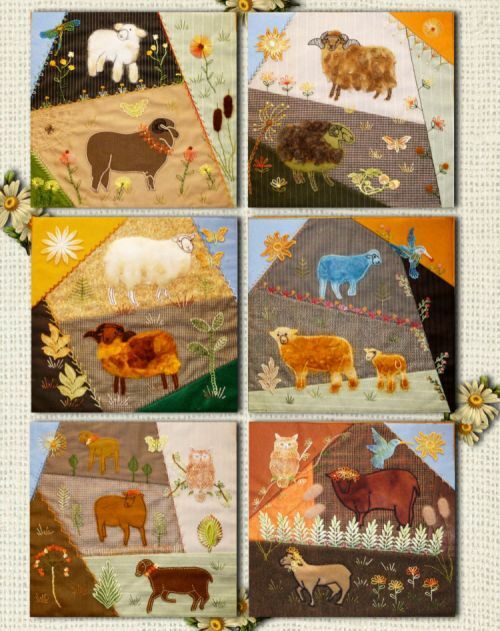 This 39 page PDF pattern documents, with many photographs, how the crazy quilt backgrounds are made for this quilt and the how the backgrounds changed for Sheep Wannabees, how to stitch all the variations of hand embroidery stitches for the crazy quilting and the embroidered flowers, and includes the instructions you need to make felted portraits for the cornerstones. Each of the 36 numbered pages has photos in overview and close up detail. You can print the whole pattern, or just the pages with the stitch instructions and the drawings for the appliques. Of course you may decide to use a different Critter Pattern Works pattern and adapt it for use with these techniques. I love breaking rules! When you look at the pages in the PDF pattern, and need to see a photo larger, just click on the "+" button at the top of the page. You can't do that with a printed book. 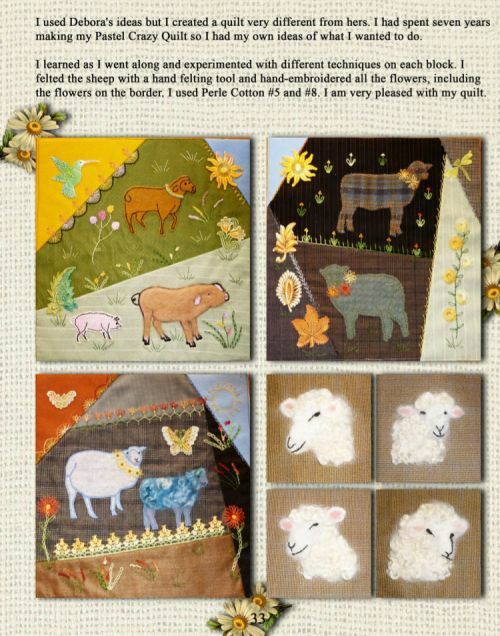 The 18 page Woolly Sheep pattern is included with the Crazy Sheep package. There are the drawings I used for critters in this quilt. These drawings are not duplicated in the Crazy Sheep PDF. I included two sheep in the Crazy Sheep PDF because I needed them for the design. 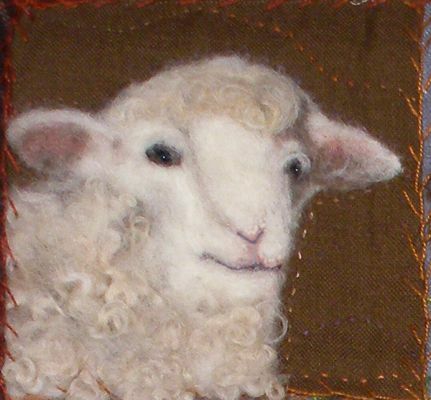 They are additions to the sheep in the Woolly Sheep pattern. The last option on the list below is the purchase the CD with both patterns on it. This is for people with ornery internet connections. 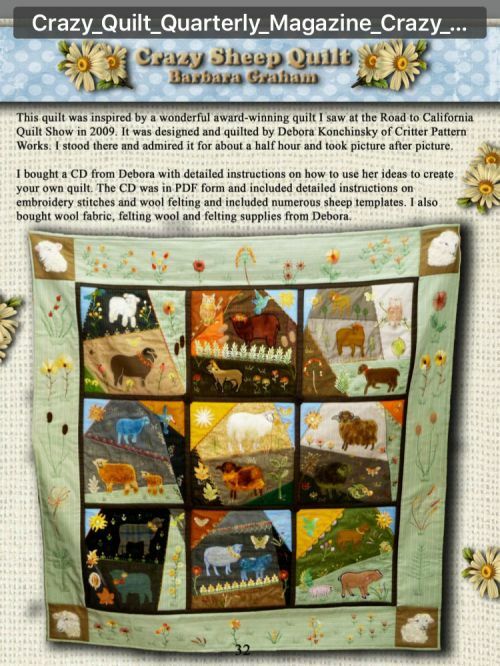 This is what we sell at quilt shows. People like to purchase something and take it with them. We have How to Applique videos if you learn visually. 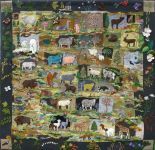 Watch our designer, Debora Konchinsky take you through all the steps to make a machine applique Critter Pattern Works quilt. Within 24 hours of placing your order for this PDF pattern, you will receive an email with a link directing you to the download location. 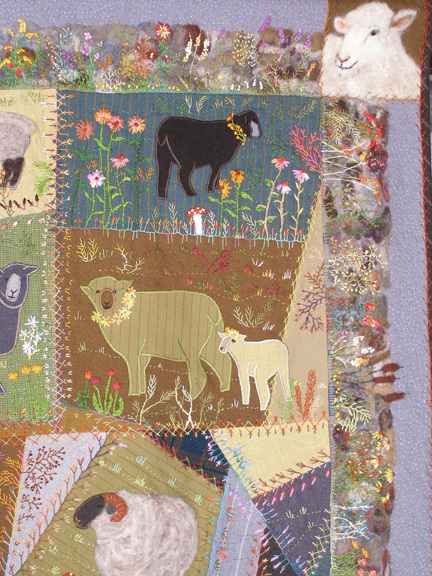 These photos are closeups of the Crazy Sheep quilt. Click on this photo to see larger images of the whole group. 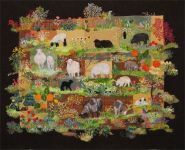 This is the felted wall around the border. It looked like a path until I embroidered the flowers. These are photos of an article in the Crazy Quilt Quarterly Magazine featuring our customer, Barbara Graham's Crazy Sheep quilt.